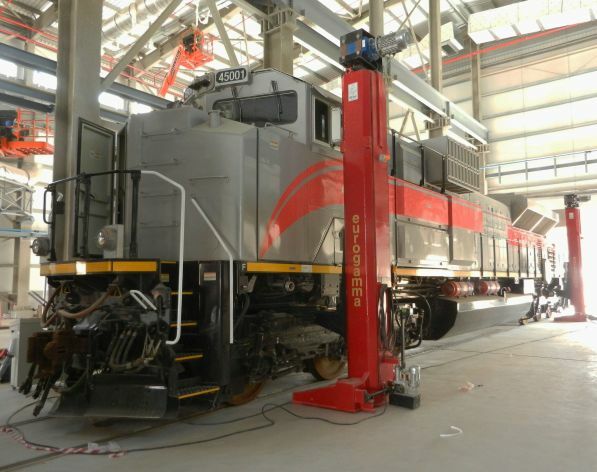 Motovario gear reducers have been serving the rail industry thanks to its collaboration with Eurogamma, a company that has been designing and manufacturing mobile lifting columns for all kinds of rail transport system in co-design with its end user since 1982. Eurogamma’s structures have a load capacity ranging from 5 to 50 tons: it is the gear reducer that manages the upward and downward movement , and consequently the load lifting and lowering. The gear reducer efficiency ensures the continuity of movement and the entire system’s reliability. Each column is individually controlled for correct and safe power take off under load. There are two Motovario products that are especially used by Eurogamma : the NMRV-P 090 and NMRV-P worm gear reducers, and the B083 and B103 helical bevel gear reducers in cast-iron cases. 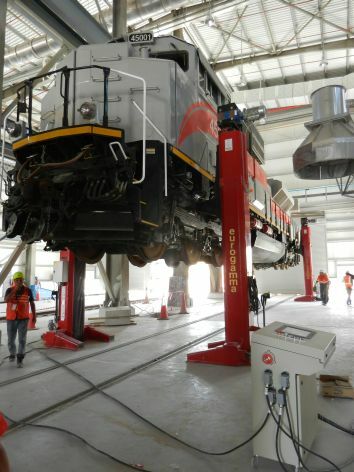 They are installed on the independent electro-mechanical mobile column-type lift. The rigidity of the structure and the worm-screw ensure mechanism durability and reliability. It is precisely in the kinematic linkage, consisting of a worm screw coupled to a female screw drive, in which the reducer is splined directly onto the shaft of the lifting screw and coupled to a brake motor. The overall transmission running efficiency makes the movement irreversible. The fully closed structure protects operators from any risk of having limbs crushed or severed. Absolute rotary encoders, screw wear sensors, load sensors, grab block sensors, the automatic control of phases sequence and many other mechanical devices and software are installed on all the columns. The redundancy of the devices ensures safe operation in all conditions. Eurogamma is an Italian company, based in the province of Florence, founded in 1976 and certified ISO 9001: 2008. Since 1985, all of its lift systems consist of lifts and control units equipped with microprocessors designed and produced by the company. The company has made great strides by introducing the use of 3D design systems with devices such as the FEM (Finite Element Method) analysis. Eurogamma mobile lifting systems are marketed in the United States, Hong Kong, Taiwan and Australia.